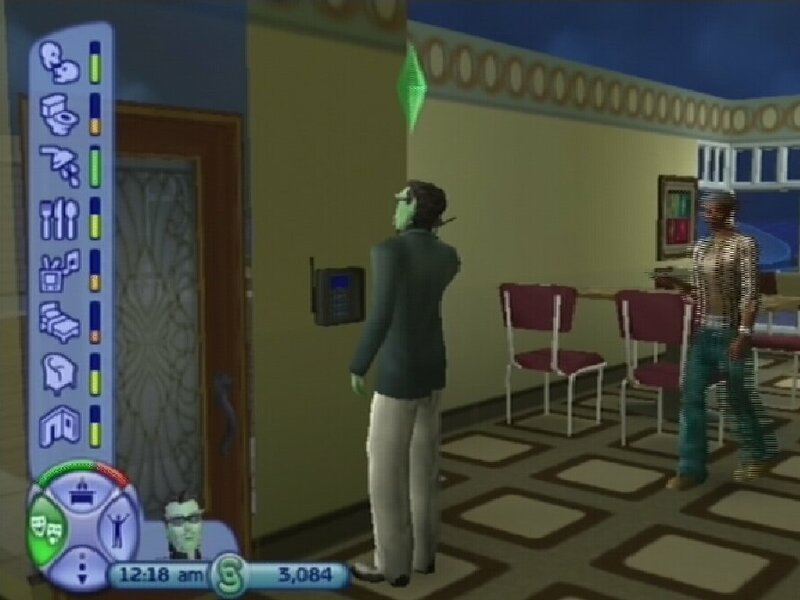 Not very long ago, EA released the Sims 2 on various platforms: PlayStation2, XBox, GameCube, NDS, GBA and more recently on Mobile as well. The PSP version is coming up soon. We won't be discussing most of them - read our previews if you want more details. But for a review of the PlayStation 2 version - basically the same game as the XBox and GameCube ones - you're in the right place. After a delayed arrival of the game, I've thoroughly checked it out. Well enough, to let you know a lot more about this game... so here goes. Note that the pictures have been captured using a TV-card, and are probably of a bit lower quality than usual. They should be fairly representable for the PS2 version though. This is Paul. Paul Spacey. He'll be taking us through the game, showing some situations he encountered in the virtual world. Don't ask me where he came from - some dark place in my head I guess - but I do know he likes to know everything. He's a nice, but fairly serious Sim. He's not very active or outgoing, and he doesn't like dirty places. His aspiration is "Knowledge". While playing the game, you'll also meet Sims with other aspirations like Romance, Wealth, Popularity or Creativity. The last one is in the place of the Family aspiration track - more about that and the other aspirations in a moment. So, how was Paul created? With the Create-A-Sim mode in the game of course. You can do quite a lot here. 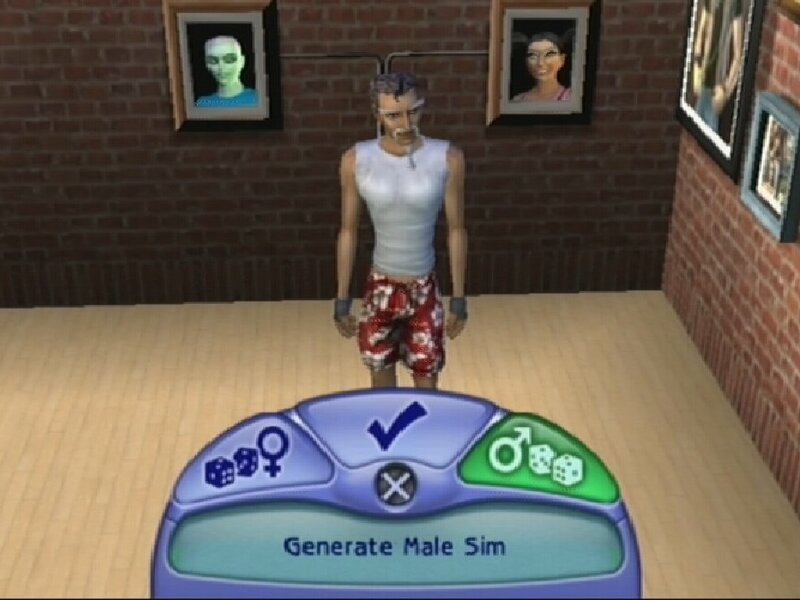 First you can generate a random Sim. This is done by choosing a gender. The four grandparents will be created, followed by two parents and finally your own Sim. This is as far as the genetics in the game go as well. All Sims that are created as adults, so visually your Sim might look just as old as their grandparents... but let's just say the pictures on the wall are from a family photo album. And yes, you're right: no children in this game, hence the Family aspiration no longer exists. It just wouldn't make sense without the kids, whereas creativity does make more sense with the new food and fashion systems. Next up is customisation. Here's where you get the real power in your hands. 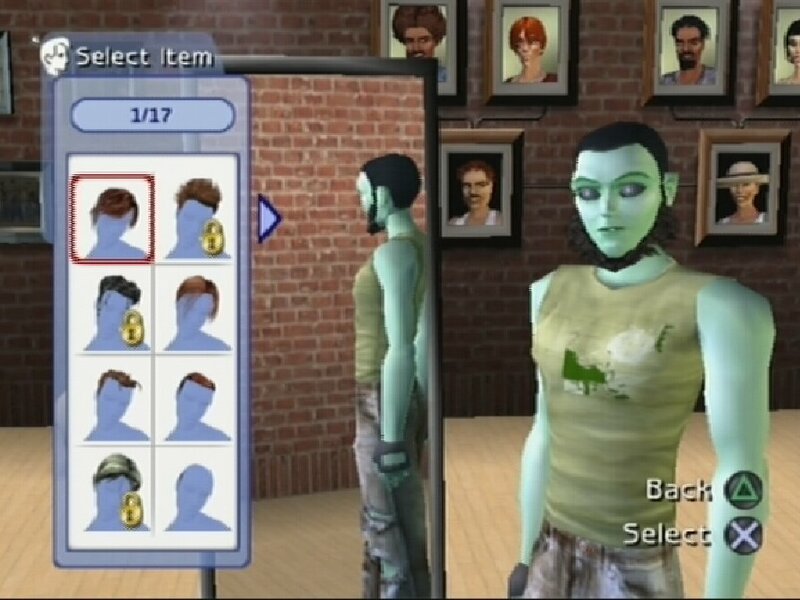 You can change the skin and eye colours (include those of aliens), give him or her a haircut, and then shape your Sims' head and body using morphing techniques similar to those in the Urbz. In fact, the entire CAS mode is similar to the one in the Urbz. Fans of the PC game will notice that at some places CAS is better, at others it's not as good. 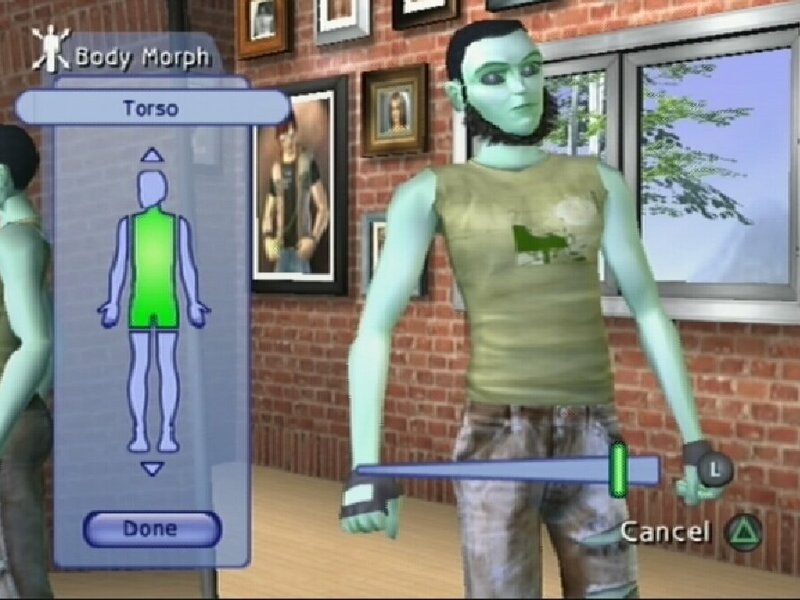 For example, morphing the head doesn't go into as much detail as on the PC, but on the PC it's impossible to morph the body - you can only choose between fat or skinny Sims. What's also useful is that at any time during CAS you can zoom in or out, and rotate your Sim, so you can get a good look at him/her before you take your Sim into the big wide virtual world. 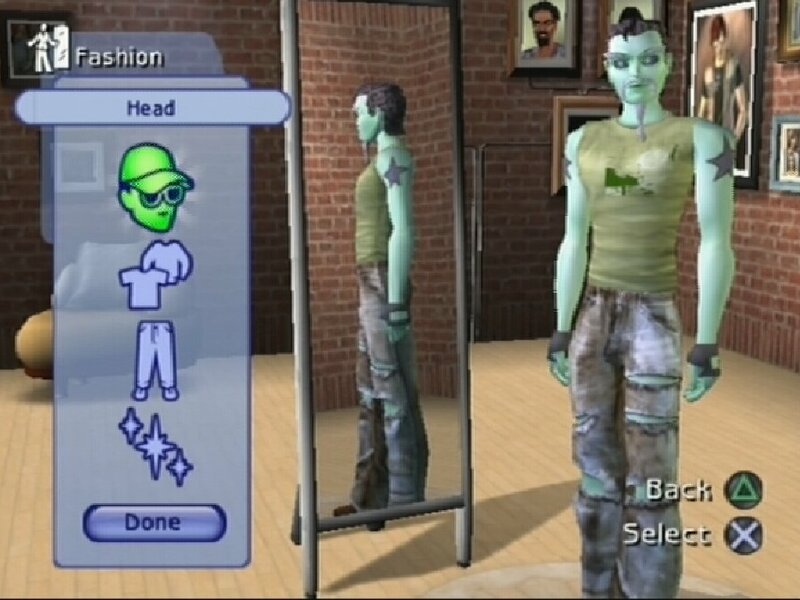 Once you've decided a shape for your Sim, it's time for some fashion. This includes the haircut (and colour), tattoos, jewellery and of course some clothes. Tattoos and jewellery can be put on several places on the body - again similar to the Urbz. Besides all that you can also pick hats, caps, facial hair and glasses. Now when it comes to picking clothes, you're in for something new. On the PC everything can be customised though downloadable content or, if you have the skills, you can make something yourself. 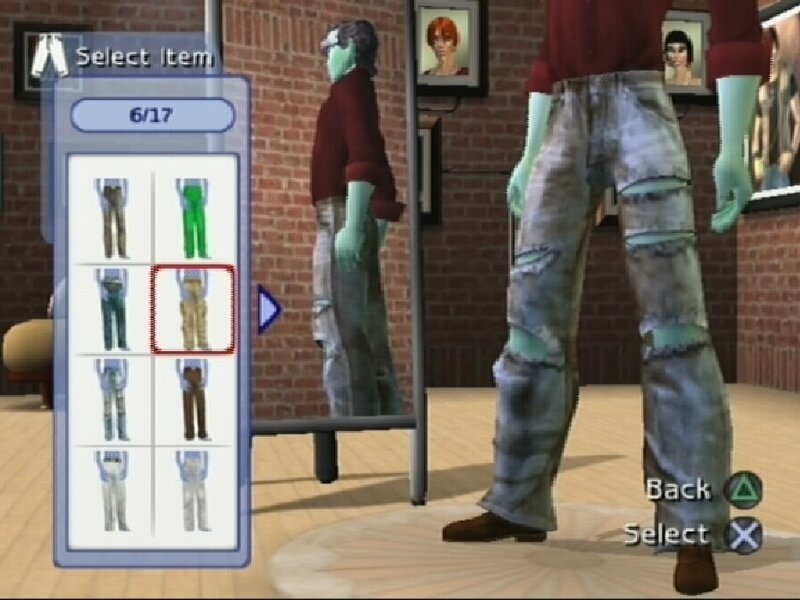 This is not possible on the current generation of consoles, and thus Maxis has to look for other ways to offer a large variety of fashion. This year you can put three layers of shirts on top of each other, and pick a sleeve length and colour (texture) for all shirts. Similarly, you can also choose the length of the trousers of your Sim. Unfortunately the number of undershirts is very low. The overshirts and jackets have some more variety, although you'll have to unlock most of it during the game. 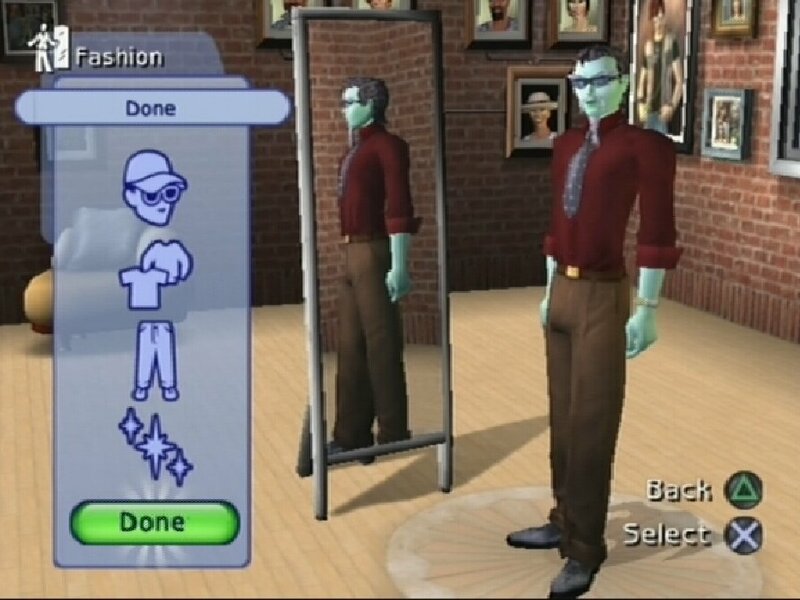 As you need to unlock most items, you can go to a wardrobe in the game at any time, and change the way your Sim looks. In fact, you'll need to do so if you want to complete all goals. Finally, it's necessary to pick an aspiration and personality. As always you can choose a starsign or set the traits manually using several bars. 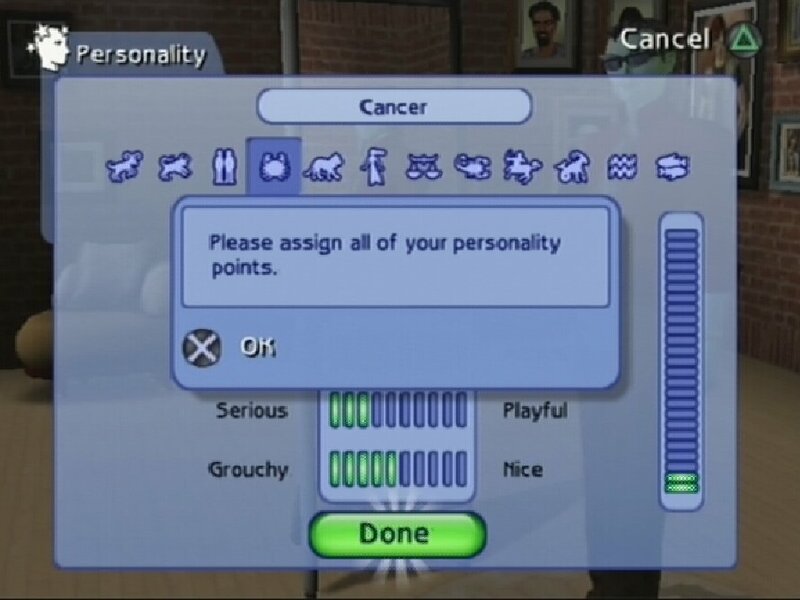 Unfortunately it's not really possible to make a sloppy, shy, lazy, serious and grouchy Sim, as you are forced to use all personality points. You also have to pick one of the five aspirations mentioned ealier on. Romantic Sims will want to make out with every Sim they meet, whereas a Wealth-Sim will try to get a wallet that's as fat as possible. A Knowledge Sim, like Paul, gets wants related to discovering the planet, and Popularity-Sims are out to find friends. Completely new is the Creativity aspiration, which will let your Sim want to experiment with food, art and music. 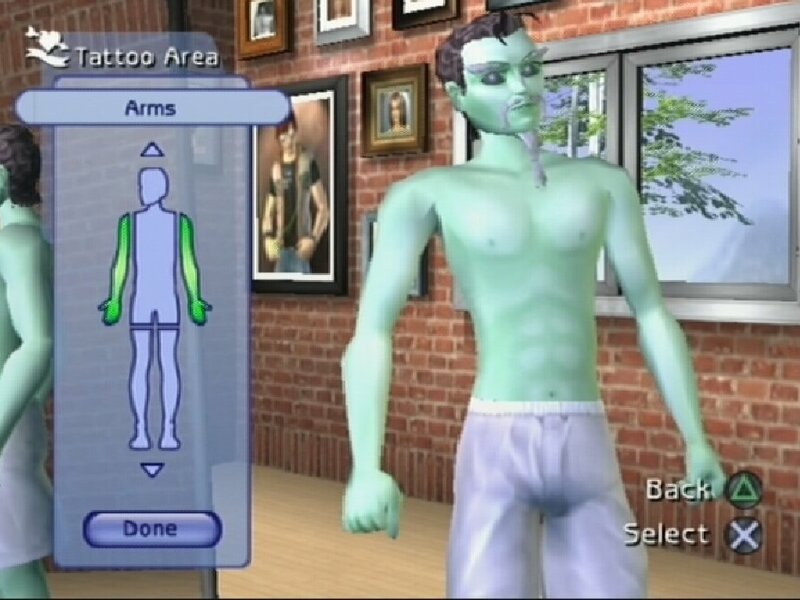 You can pick this for your Sim, but I found that there are enough Sims with that aspiration in the story mode already anyway. There's quite a heavy focus on this Creativity aspiration compared to the others - probably mainly due to the new food system as well. 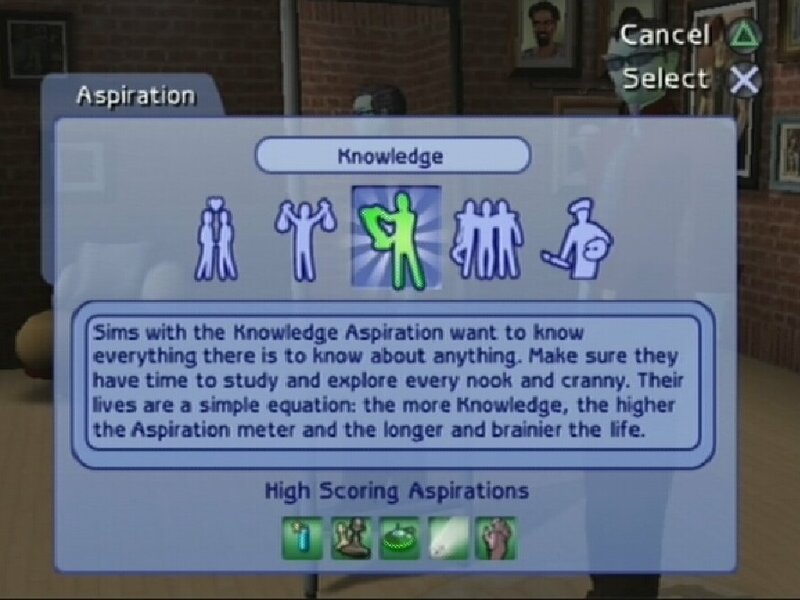 The aspiration chosen during Create-A-Sim will determine some of your gameplay throughout the game. The wants and fears of your Sim are based on it. Paul for example would like to meet and be abducted by aliens, or discover a comet. 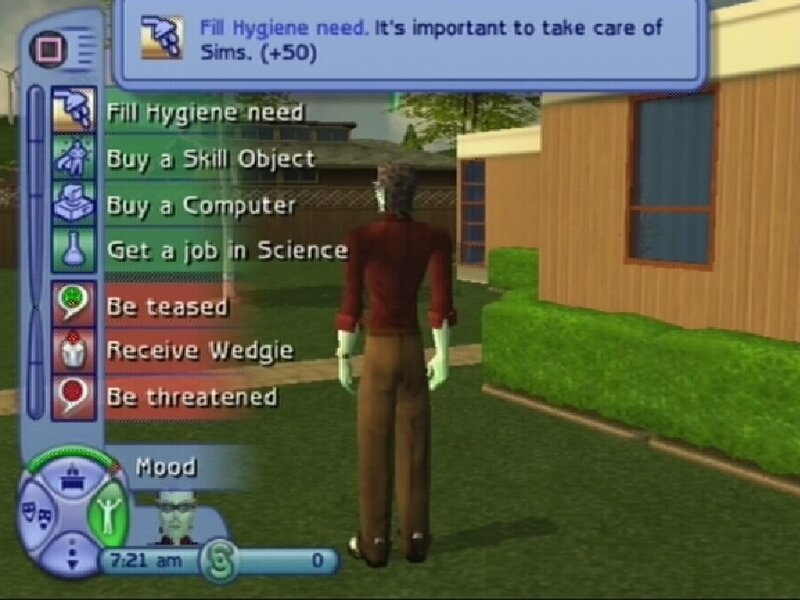 At any time all Sims have 4 wants and 3 fears. Completing wants gives you more aspiration points, which in return unlocks new objects. Forget the platinum mood of the PC version - it doesn't exist anymore. There is a bar in the needs sidebar that does fill up to platinum, but it doesn't seem to make much of a difference. Fulfilling a fear means some points will be subtracted. Unlocked objects will remain unlocked - it'll just take a little longer to unlock more of them. Also, in story mode, all points of all Sims you can control are counted together, to form the cumulative number of aspiration points. That's also the number that counts when it comes to unlocking stuff. Once you're done creating a Sim, you're ready to be thrown in the story. Well... Story might be a bit optimistic. Your goals are based on golden and platinum wants. Your Sim has one of these at any time, where a golden want helps you through the lot and a platinum one unlocks one of the 12 locations. You'll first need to complete the gold wants before you get a platinum one. 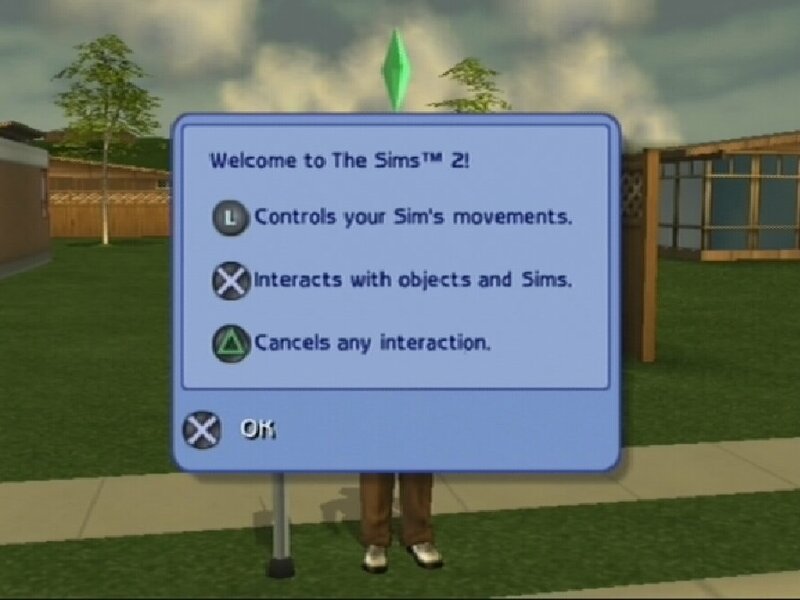 Although at the beginning of the story you'll only need to control your Sim, and fulfil golden wants of your Sim, this changes after a short while. You have to help other Sims with their golden wants as well, and so progress through the story. And that's about all the story there is as well. No background whatsoever - you have to make that up yourself if you want one. There are just goals, only some following up a previous one in a logical way. There are locations where some of the existing Sims share their thoughts and so tell you what they want to do, and that's really as close as it'll get to a story. Also, you can't complete the goals in a random order. You might have a few goals at a time, if other Sims in a location need to be helped, but those are in a specific order as well. This unfortunately makes the game feel a little too linear at times. It also happens that you're thinking "I've just done that already!" when you get a new goal - for example buying an object of at least 500 simoleons. The goals aren't too challenging in general. Some might take some time indeed, a few are a bit vague, but all in all it should be possible for anyone to open up the first couple of locations within just a few hours. 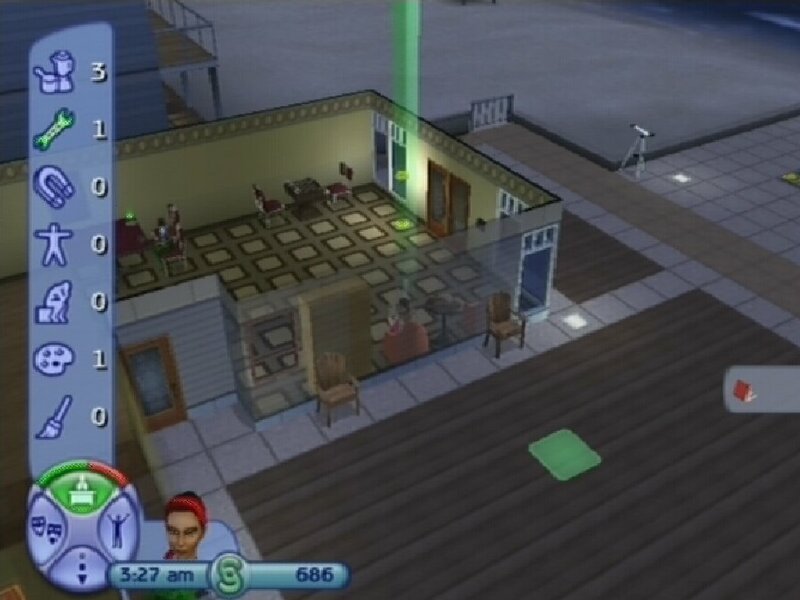 Once you need to start helping other Sims you get more goals to complete on a lot and thus it'll take a little longer, but you can also unlock multiple locations within one 'level' - and thus get a less linear game. Also, despite the lack of a real story, the goals do keep you going. As you start off in the game, you get a basic introduction to the game. The controls and goals are explained, and within roughly 15 minutes you should master the basics of the game. Very useful for new players of the Sims series, others are more likely to just get it over with. You can't skip it, but it doesn't take very long and doesn't get too annoying. What's not explained too well in this tutorial is build/buy mode. You're forced to buy something from the goals. Now this isn't very hard to accomplish, but that's coming from someone who has played the Sims Bustin' Out and the Urbz as well, and not to forget all PC versions. If you're entirely new to the game, the controls might be somewhat confusing at first, and little help is given compared to other elements of the game. The screen does show that you can press Select to get some help, but it doesn't stand out a lot and you may look over it. Nevertheless it should get you going, and after some trying you should be able to purchase objects. Otherwise most things are explained when necessary. If you switch to classic control for the first time for example, you'll get a message about the two different control modes. If you don't press select until the end of the tutorial, you'll be told after unlocking the first new location anyway. Brand new is the new Direct Control feature. In this mode you'll be able to directly steer your Sim in the direction you want to. This way several things can be done a lot faster, and especially socialising is a lot nicer this way. When you walk up to an object you press the action button, after which you see the possible interactions. It works quite well, but unfortunately Maxis left a few things to be desired. For example, while holding a plate of food, and walking up to a sink or dishwasher to wash the dishes, the "Wash Dishes" interaction isn't in the submenu of the sink, but in the "Food" menu. This isn't very intuitive, but it gets worse. When getting the bills, walking away from the mailbox and then paying the bills, you still have to mail them. Makes sense so far, except that when you want to mail the bills, guess where the "Mail bills" option is. My guess is that you're wrong. It's on the mailbox, and not the bills. This lack of consistency makes you look for the right option in several places and does get a bit annoying. The best place for these options would be in both submenus. There's also still the classic control. If you want your Sim to do whatever he thinks is necessary, use this mode as then free will will also kick in for the selected Sim, unlike in direct control. Also the cursor is a bit clearer than before. The square the cursor is on is highlighted green, and then there's a green line to the top of the screen. 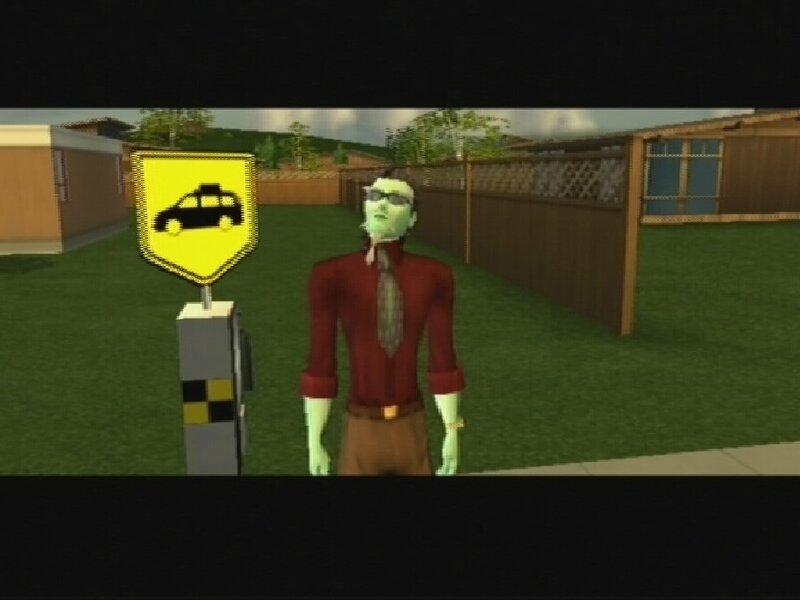 There's one small graphical glitch, that occurs when you move the cursor to a sim (circle on PS2) or selecting another Sim. The line of the cursor will move, but the square where the cursor is will not be highlighted - instead that highlight won't move until you move the cursor manually again. It's merely a small issue though, but it feels like something that could've been easily fixed. It's not the first time that a game has small issues like these, which tend to be final touches that make the game feel like it's really done. When it comes to the camera, you're the most free to move it wherever you like in the classic control mode. As in direct control the camera is always centered at your sim, it can sometimes be a little tricky to find a specific object on a lot, for example a telephone. Just zooming out doesn't always work, and to prevent you wondering around the lot it's best to go into the classic mode. 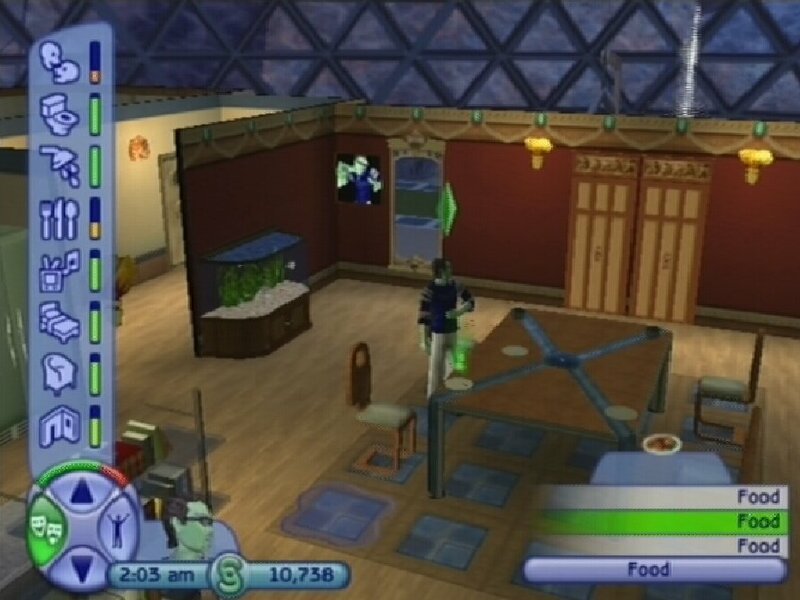 Even then you might miss the free camera that's in the Sims 2 on PC. You can't position the camera every way you prefer - you can just zoom in/out and rotate it. The camera is tilted during the zooming, and when you're completely zoomed out you'll look almost straight down. I've found myself looking around for objects more than once, and a camera that allows you to do more would be useful. Then again, it would probably be too hard to control properly as well, so for that matter Maxis has chosen the best way. 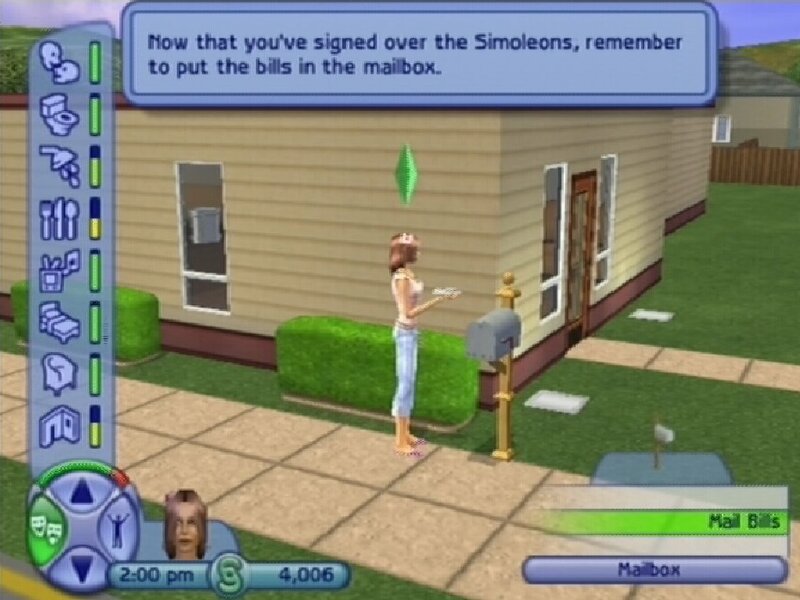 Since controlling your Sims is the most important part of the game, there are some other things that get annoying at times. In direct control you need to be turned to the object in a certain angle before it appears in the menu. This angle could've been slightly bigger to make it easier to select the object you want. Before you enter the menu though, all objects that are in the selection area are highlighted - this is the same in classic control too. However, when you have a few newspapers, a double bed, or generally more of the same objects near each other, it's a bit harder to pick the right one as it comes down to guessing. That's mainly because the entry you highlight in the menu, isn't highlighted in the 3D world. As a result you're not sure which paper, or which side of the bed, you actually chose. Two Sims might end up trying to get in the same side of the bed - after which the second will autonomously move to the other side - or you might be trying to look for a job in an old paper that should be recycled. Finally, in direct control mode again, when you try to socialise with a Sim that's walking away from the lot, the Sim you're controlling may be sort of stuck. 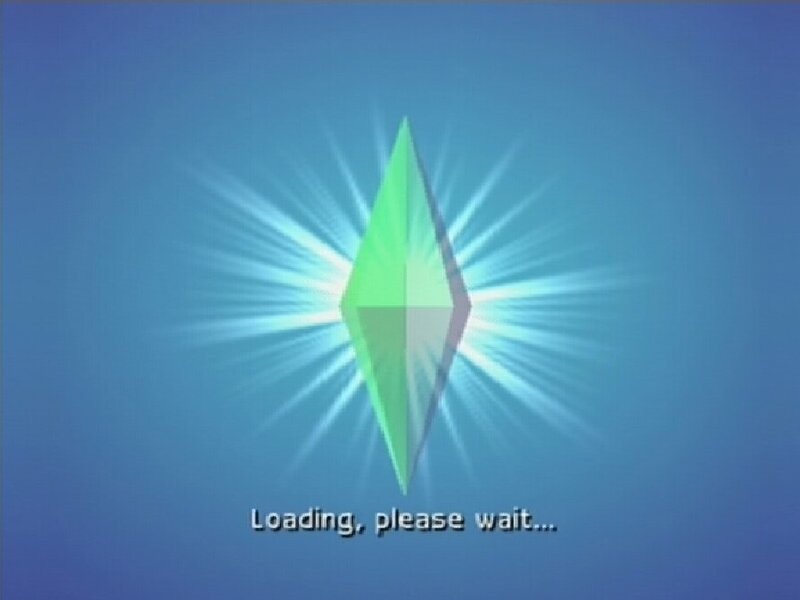 The time-out for the interaction is long, and until this time-out occurs or the Sims actually start socialising, you cannot control your Sim at all. They might walk around autonomously a bit, or just stand still, but you will be forced to wait. 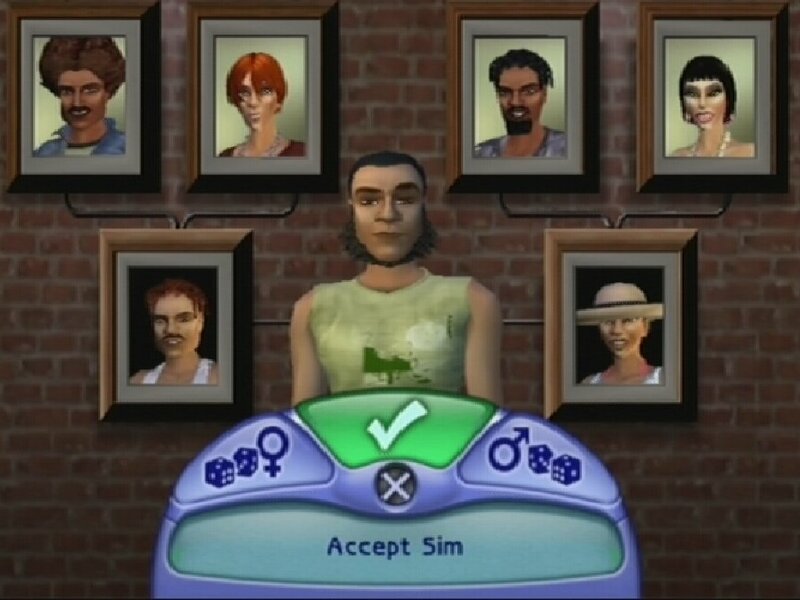 Because socialising in direct control requires direct interaction from you, you can't select another Sim. Hence it would be useful that when you press the Cancel button while waiting, your Sim should stop trying to socialise. Unfortunately this is not the case. Written at 03:43 on Friday 16 December 2005 by ChEeTaH.